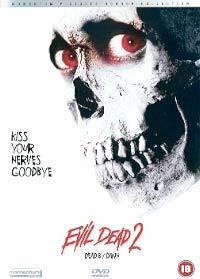 Five years after the incredible little shocker The Evil Dead, more money and a cult following behind it spawned this sequel with the Three Stooges comedy antics stepped up into overdrive. 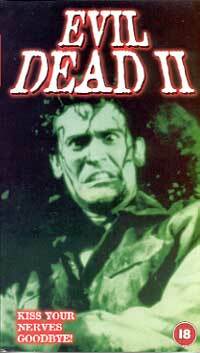 Raimi's inventive style nurtured on the first movie, blooms even more in its sequel. The opening is pretty much a recap of the first film leading up to its cool ending, blasting away from that same point into a whole new chapter of cinematic psychosis, great special FX and madcap humour. 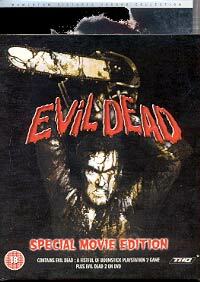 Here Bruce Campbell proved not only to be a great horror and physical actor, but also a fantastic comedic one. Strapped with his chainsaw, shotgun and a host of quotable lines, Campbell became a fully-fledged horror-action-man. The UK DVD release features a funny commentary by Raimi as well as an FX featurette.